Margaret Prescod of Every Mother is a Working Mother Network and Women of Color in the Global Women’s Strike, speaking to the Progressive Caucus of the California Democratic Party. Dec 9: Pack the court for Carolyn Hill! 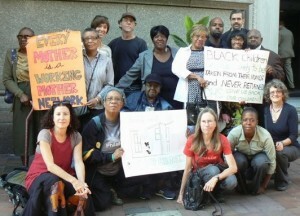 Some of the many who came to Superior Court hearing in August, 2013. Carolyn Hill is in blue top with grey jacket. Last chance for Carolyn Hill to adopt her two nieces, abruptly and traumatically removed from her home by the Dept of Human Services because she is a low-income Black woman with no GED. Forward the press release to your media contacts and on social media. Please consider a financial contribution to help with the substantial costs of this case. Carolyn Hill is fortunate to have a dedicated pro-bono lawyer, Sam Stretton, but there have been fees and expenses that urgently need to be covered, including a $1500 fee to cover an expert witness.